The federal judge is waging a one-man war on bank-friendly SEC settlements. Long before he began crossing swords with the Securities and Exchange Commission over its tepid response to the 2008 financial collapse, US District Judge Jed Rakoff had already established a reputation for speaking his mind on the major issues of the day. But in his refusal to allow the SEC to rap a few knuckles and move on, the judge seemed to be speaking for everyone who shared his rage at the lack of accountability on Wall Street and the reluctance of the regulatory and legal systems to do much about it. The more he researched and thought about the financial crisis, and the more cases he presided over involving its aftermath, the more Rakoff came to believe the latter. That stance has guided a series of landmark rulings in which he has challenged the SEC’s preference for consent decrees—agreements in which banks pay a token fine to settle complaints without admitting guilt—and placed the agency’s lax approach to regulatory oversight in the national spotlight. Bank of America was in hot water over the way it had taken over Merrill Lynch in 2008. The takeover, which had come at the urging of the Treasury, prevented a tottering financial edifice from collapsing and setting off what could have been a catastrophic global domino effect. The problem was that, to sweeten the deal and smooth the process, Bank of America had allegedly secretly authorized Merrill to pay out up to $5.8 billion in year-end bonuses. According to the complaint, the bank had also hidden from its shareholders that Merrill was about to post enormous fourth-quarter losses, which would likely have provoked a shareholder revolt against the action. By putting a kibosh on the deal, Rakoff embarrassed the SEC into taking another look at Bank of America’s actions. When the parties returned to Rakoff after a full discovery process that laid bare the facts of the case, the terms of the deal had changed. Now Bank of America was going to pay a $150 million penalty; the money would come from Merrill shareholders rather than the bank’s; and the merged institution agreed to implement a series of prophylactic measures to prevent such actions from occurring again. Ideally, Rakoff felt, such settlement agreements should hold individual decision-makers responsible for their organization’s actions and should also involve admissions of wrongdoing. Nevertheless, what was on the table was, he felt, a whole lot better than the original settlement. So the judge held his nose and accepted the deal. Two years later, in a blistering November 2011 ruling that was notable for its strong tone and moral judgment, Rakoff tossed out a settlement between the SEC and Citigroup that allowed the firm to pay a $285 million fine—without admitting guilt—for allegedly selling a billion-dollar fund it knew was filled with toxic mortgage debt, and then betting against its own customers to profit from the failure. Citigroup had made $160 million on the deal; its investors had lost more than $700 million. The settlement might have been good enough for the regulators, but Rakoff felt that the penalty left “the defrauded investors substantially short-changed.” Besides, he added, he wouldn’t be able to determine whether the settlement was in the public interest until the SEC produced more information about Citigroup’s practices before 2008. Unfortunately, not all judges agreed with Rakoff’s analysis. On June 4, the Second Circuit Court of Appeals overturned his Citigroup ruling. Rakoff had “abused” his discretion, argued Judge Rosemary Pooler, author of the appellate court’s decision, “by applying an incorrect legal standard” in his review. “Consent decrees are primarily about pragmatism,” Pooler added, essentially holding that if both parties to the lawsuit agreed to settle, the judge really couldn’t stand in the way. In other words, Rakoff’s sense of moral unease simply didn’t have a place in the process. This was about getting deals done and moving on, about helping firms and regulatory agencies manage risk; it was not about seeking the truth. 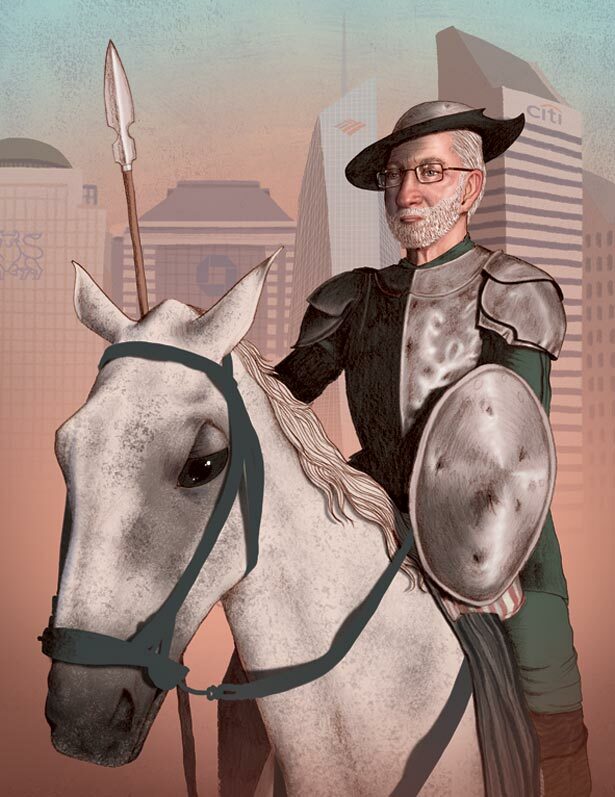 That leaves Rakoff in an unusual position: standing on the side of full disclosure and the public interest even as the appeals court sides with the banks and their regulatory enablers. The walls in the waiting room of Judge Rakoff’s thirteenth-floor chambers are adorned with family photos and snapshots of generations of his clerks, most of them graduates of Harvard, Yale, Columbia and NYU law schools. On a coffee table are a few biographies of Daniel Patrick Moynihan—appropriately enough, given that this is the Moynihan Federal Courthouse in lower Manhattan, and that it was Senator Moynihan who recommended Rakoff for a federal judgeship in 1995. The two had met in Washington for an interview and ended up discussing their mutual intellectual passion—Indian history—for a few hours. The other books on the coffee table include one by the judge’s younger brother, Harvard Law School professor Todd Rakoff; a volume on the Yankees (a lifelong fan, the judge keeps a ball signed by Mariano Rivera in a glass case on his desk and has been known to devote considerable time to teaching young law clerks how to keep a box score at games); and an art collection. Amid these books are several photographs of the judge and his wife in full ballroom regalia. Rakoff took up ballroom dancing in late middle age and has pursued it with considerable passion. (He is also an amateur actor and writer of musical skits for the annual dinner held for courtroom employees, and he gleefully reports that Supreme Court Justice Sonia Sotomayor performed one of his songs a few years back.) In his ballroom outfit, he looks like a man whose cares are in temporary abeyance. Rakoff dances in a tuxedo and top hat, his gray beard trimmed like that of a nineteenth-century gentleman, his left hand gripping a silver-topped cane. The judge’s eyes sparkle behind stylish, transparent-rimmed spectacles. His wife, in these coffee-table photos, is wearing a yellow ball gown with a glorious ruff. Further into the antechamber is a corkboard. On it are the week’s court schedules, along with a series of newspaper headlines. One, from 2002, leaps out: Fed Judge KOs Death Penalty. Rakoff argues that the law is “applied morality,” and he turns for inspiration to the “great dissenters”—judges who wrote dissenting opinions, or “clarion calls,” on issues such as the legality of slavery and Jim Crow, knowing that they would be viewed more favorably by history than by their contemporaries. For the people who know him, it’s no surprise that Rakoff has set his moral energies to work in trying to right the wrongs of the financial collapse, and in demanding that large financial institutions be held fully accountable for their shady dealings in the years leading up to the crash. It is in keeping with his character that he has pursued this line of argument even though—or perhaps especially because—the odds seem stacked so heavily against him. On the surface, the recent Citigroup ruling is very dispiriting. But it might turn out to be a battle lost on the way to winning a larger war. Despite the decision, Rakoff has unquestionably changed the terms of the debate about financial accountability and has prompted the SEC to get at least a little bit tougher on the banks. And he’s not letting up. Since Mary Jo White took over at the SEC in April 2013, observers have noticed a shift in the agency’s procedures: now it looks to assign blame before agreeing to settlements in more serious cases. Three months into her tenure, White told The New York Times that “defendants are going to have to own up to their conduct on the public record.” That summer, JPMorgan Chase was forced to admit it had violated securities laws in the much-publicized “London Whale” case, which was coordinated by US and British authorities. Some large hedge funds, including Harbinger Capital Partners, have also had to acknowledge wrongdoing before signing settlement agreements with the SEC. In his original Citigroup ruling, Rakoff averred that when the SEC and a bank came to a judge with a deal, they were in effect asking “the court to employ its power and assert its authority when it does not know the facts.” He has spent much of the past several years trying to get at those facts, attempting to shine a light on the decisions that led to the financial catastrophe. The appeals court ruling may have put the brakes on this process, but Rakoff will, in all likelihood, remain a high-profile critic of the backroom deals that have characterized so much of the post-2008 cleanup.